You’ve heard terms like charter bus, minibus, party bus, and entertainer bus. What’s the difference between them, and which do you need for your upcoming trip? Keep reading for a breakdown of each type of bus rental. We’ll show you what they look like, what’s included with each, what events they’re best for, and more. A charter bus, also known as a motor coach, is a passenger vehicle rented by organizations and individuals for group travel. A licensed commercial driver picks passengers up at their starting location and takes them to every stop on their itinerary. Seating. Motorcoaches have anywhere from 36 to 60 seats, making them ideal for corporate events, sports tournaments, wedding guest transportation, family reunions, guided tours, field trips, church retreats, and more. The most popular seating options are 47 seats, 55 seats, and 56 seats. Amenities. Passengers can ride in comfort and luxury with reclining seats, air conditioning, a restroom, TV monitors, and a DVD player. Upon request, bus rentals may also include Wi-Fi and power outlets for groups who need to stay connected. Storage. Keep your luggage and equipment in the open space under the bus. These storage bays typically have enough room for each passenger to bring a suitcase if needed. Inside the motorcoach, overhead bins hold personal belongings to keep the aisle clear. Distance. Most buses can travel both locally (often classified as under 200 miles) and across state lines. Because they come standard with amenities like reclining seats and restrooms, coaches are excellent for long distance trips. Rental Terms. Motorcoaches are priced by the hour, day, or mile depending on your trip’s itinerary. For more information about rates, check out our detailed pricing guide. A minibus is a small motorcoach that holds less than 35 seats. People use them as shuttles for airports, hotels, festivals, concerts, conferences, weddings, day trips, and more. Seating. 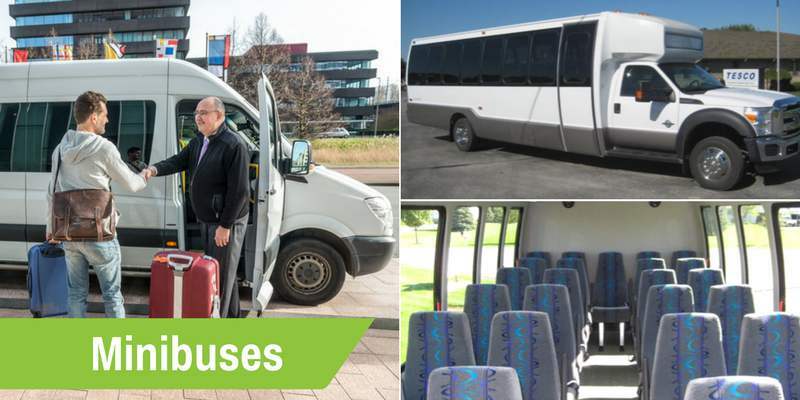 While minibuses are made to hold 10 to 35 passengers, the most requested sizes are 18 seats, 20 seats, and 25 seats. Amenities. These compact coaches come with air conditioning, reclining seats, TV monitors, and DVD players. Some newer models also come with Wi-Fi and power outlets. Storage. Since minibuses are best for short trips, many come with overhead bins for small luggage and personal belongings. Some also have a small trunk in the back of the bus for storing items. Be sure to let your reservation specialist know how much storage space you need at the time of booking. Distance. People most often rent minibuses for local use, but some bus companies also allow them to be used for interstate trips. Rental Terms. Like charter buses, minis are rented by the hour, day, or mile depending on your trip’s itinerary. Typically, minibuses cost $100-200 less than a standard bus. What is a party bus? With mini bars, special lighting, and a space inside for dancing, party buses provide a fun alternative to limos and standard charter buses. They are used for birthdays, proms, weddings, bachelorette and bachelor parties, and more. Because of their similarities to limos, bus companies also refer to them as limo buses. Seating. Though manufacturers make party buses that hold anywhere from 10 to 50 people, the most requested seating options are 14 passengers, 20 passengers, and 28 passengers. To make room for games and dancing, its seats are arranged along the edges of the bus. Amenities. For the perfect party atmosphere, most party buses include lounge-style seating, fiber optic lighting, a premium sound system, beverage coolers, a TV monitor, and air conditioning. Storage. Some buses include overhead bins or storage space under the seats for personal belongings. Let your bus reservation specialist know how much storage space you’ll need when booking your rental. Distance. Though some bus companies allow party buses to travel across state lines, many are local-use only. Rental Terms. The most common pricing options for these buses are hourly and daily, and their rates are similar to standard charter buses. What is an entertainer bus? Touring artists and celebrities use entertainer buses as luxurious motor homes. Use these spacious coaches to give your group a place to work, sleep, and play while on the road. Seating. Entertainer buses have lounge-style seating with room for 8 to 12 people. Amenities. Because they function as temporary houses on wheels, tour buses include a kitchen, lounge area, bunk beds, a master suite, restroom, satellite TVs, Wi-Fi, power outlets, and more. Select bus providers allow artists to request custom modifications. Storage. Passengers store their belongings under the bus in luggage bays and storage compartments inside the bus. Artists who need extra storage space for equipment rent trailers that hitch to the back of the bus. Distance. The majority of professionals use tour buses for long-distance travel. Occasionally, they are rented locally as high-end shuttles, temporary recording studios, and movie set trailers. Rental Terms. While most buses are chartered by the day or mile, some companies will negotiate monthly or yearly contracts for touring artists. For a detailed breakdown of the cost, check out our tour bus pricing guide. Still not sure which bus you need? Call our reservation specialists at 1-855-826-6770 for a free consultation and quote! Call GOGO Charters at 1-855-826-6770!